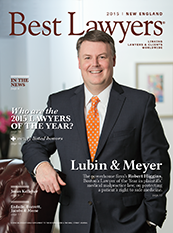 New England's Best Lawyers a publication of Best Lawyers® distributed as part of The Boston Globe on May 1, featured Lubin & Meyer partner Robert Higgins on the cover. Rob, who is selected as Boston's 2015 Lawyer of the Year for Medical Malpractice Law, is featured in the cover story: Safeguarding a Patient's Right to Secure and Reliable Medicine. The article describes Higgins and Lubin & Meyer as "an industry leader." “Improving any system requires change, which in turn requires leadership, and that is where we excel,” said Higgins, who obtained three of the top five verdicts of 2014 — $4.8 million in a undiagnosed myocarditis case, $11 million in a case where a doctor failed to diagnose lung cancer, and $7 million in a lawsuit where a tonsillectomy resulted in the death of a 38-year-old man. Higgins, firm founder Andrew Meyer, and their colleagues at Lubin & Meyer (all five partners are selected for inclusion in the 2015 edition of New England's Best Lawyers) are known as relentless advocates for the rights of injured patients. By calling for a better standard of care, they have exposed the lack of quality treatment available at many institutions and, in the process, helped create safer hospital environments. One example provided in the article: After a Lubin & Meyer lawsuit uncovered a flaw in a Boston hospital’s computer system that had allowed medical professionals to overdose a patient, resulting in her death, the hospital changed its protocols and instituted a backup system to safeguard against a similar tragedy. The full article can be read here on the Best Lawyers website. Lubin & Meyer attorneys are licensed and practicing in New Hampshire, Massachusetts and Rhode Island.